Ten years of renovations have passed and the Rijkmuseum, Amsterdam's museum of culture and art, is reopening to the public. This is major! Today's Google Doodle: from Spirou Magazine, it's Belgian cartoonist André Franquin's "Gaston Lagaffe" feature. The Gaston comic strip is about an accident-prone office janitor. It first appeared in Spirou in 1957. While popular in many countries, only Fantagraphics has reprinted it in the US -- and even then it was a few pages in the 1990s. I don't see this here in the States, but if you use the French, Belgian or Norwegian version of Google, you get to see the above graphic. "My name is Eldon Dedini. I'm a cartoonist. I wake up each morning and try and be funny as hell." 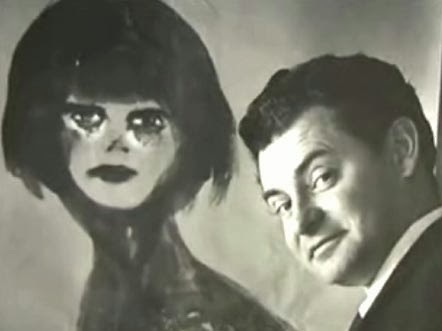 Anson Musselman has made a documentary about cartoonist Eldon Dedini titled DEDINI: A LIFE OF CARTOONS. It's about six years old, but well worth sitting down and watching while eating some lunch today. It's a great piece, with Dedini, alive and well in this film, talking about his art and making cartoons and ... well, see it. If only Musselman would do this for all the cartoonists in the world! Christmas in February? Yes. Especially if it includes all of the B.C. comic strip characters and Bob and Ray! For the first time in 19 years, CALVIN AND HOBBES' creator Bill Watterson draws cartoons! 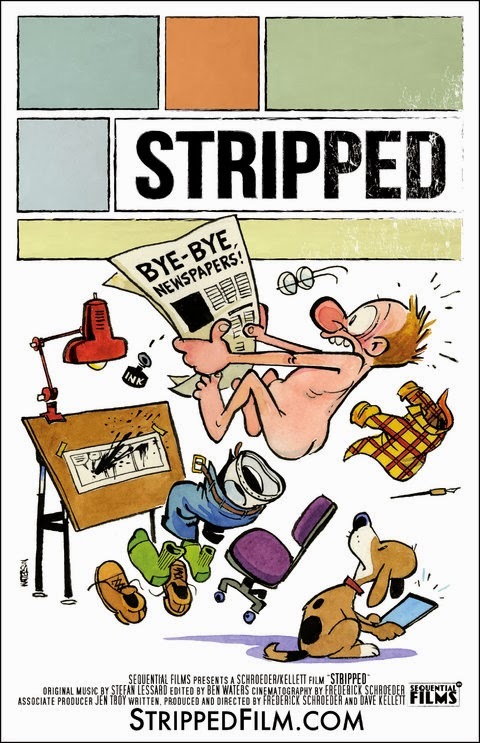 He did the above poster for the new documentary about (newspaper and online) comic strips titled STRIPPED. The NY Times has more here. Related: Michael Cavna interviews Mr. Watterson for the Washington Post here. Charles R. Bowers (June 7, 1877 or 1887 -- November 26, 1946), the director of "The Extra-Quick Lunch", 1918, was an American cartoonist and slapstick comedian during the silent film and early "talkie" era. He was forgotten for decades and his name was notably absent from most histories of the Silent Era, although his work was enthusiastically reviewed by André Breton and a number of his contemporaries. As his surviving films have an inventiveness and surrealism which give them a freshness appealing to modern audiences, after his rediscovery his work has sometimes been placed in the "top tier" of silent film accomplishments (along with those of, for example, Charlie Chaplin, Buster Keaton, Harold Lloyd). In comic style, he probably modelled himself after both Harry Langdon and Buster Keaton and was known to the French as "Bricolo." The son of Dr. Charles E. Bowers and his wife, Mary I. Bowers, Charles Raymond Bowers was born in Cresco, Iowa. His early career was as a cartoonist on the Mutt and Jeff series of cartoons for the Barré Studio. By the late 20s, he was starring in his own series of slapstick comedies for R-C Pictures and Educational Pictures. His slapstick comedies, a few of which have survived, are an amazing mixture of live action and animation created with the "Bowers Process." Complex Rube Goldberg gadgets also appear in many of his comedies. Two notable films include Now You Tell One with a memorable scene of elephants marching into the U.S. Capitol, and There It Is, a surreal mystery involving the Fuzz-Faced Phantom and MacGregor, a cockroach detective. He made a few sound films such as It's a Bird and Wild Oysters, and wrote and illustrated children's books in his later years. For eight years during the 1930s he lived in Wayne, New Jersey, and drew cartoons for the Jersey Journal. After succumbing to severe arthritis, his wife started drawing them under his direction. Following a long illness, Bowers died in 1946 in Paterson, New Jersey, and was interred in that city's Cedar Lawn Cemetery. His work, long forgotten, has undergone a rediscovery and revival of interest in recent years. His 15 surviving films were the subject of a 2004 two-DVD release by Image Entertainment and Lobster Films of France. Much more of his work is thought to exist in various film archives. PBS Mountain Lake's "Roadside Adventures" host Derek Muirden visits comic book artist Sid Couchey (1919-2012) on a past episode of "People Near Here." Mr. Couchey created the legendary comic book Richie Rich as well as many other Harvey Comics characters. Hey! It's been eight years of the Mike Lynch Cartoons blog! I don't have to tell you the time commitment that I've put into the blog. I started it because, way back in 2006, there wasn't a blog that talked about professional gag cartooning. 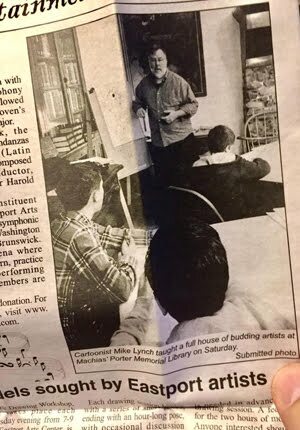 There wasn't a place that could tell you about what it was like to do this: the markets, writing gags, how to deal with rejection, how to not procrastinate; letting you know that while cartooning is a job that you may love, it's still hard work. But time is money and I have to do something I've never done before: ask you to contribute to keep this blog going. Times are tough all over, but if you are a fan of cartoons, a pro, or on your way to becoming a pro -- and if you think this blog is worthy -- please consider helping. "I read your blog most every day and thoroughly enjoy it." "I know you love all the old cartoonists. you seem concerned about them all ... you don't seem to be jealous of them - just caring towards them." "Thanks for the inspiration, sir." The faces behind the voices! YouTuber Raquello has put these together, with annotated samples of the animated and live-action movies through the years. We would have liked to have included Daws Butler and June Foray, but unfortunately were unable to find any footage beyond interviews. If some turns up perhaps there will be a fourth episode of this exciting and interesting series for animation and film buffs. Julie Bennett was featured in an earlier video, but makes a return engagement because we couldn't resist using that commercial. Sorry for no Alvin clip, but it seems the Alvin people are touchy about people posting their videos on YouTube, so we'll do without it. Fergus watches as I get the snowblower out of the basement to deal with the 12-15 inches of new snow. Rina﻿ does great work. Period. But this -- this is a departure. She's drawing in a different, very energetic style. It's so well drawn and so funny. I laughed out loud real hard a couple of times. Bullseye! 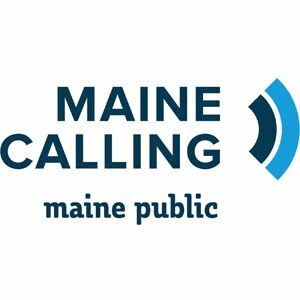 Snow -- up to another foot of it -- thru this afternoon and tonight. Still, earlier in the day I saw a half-dozen bluebirds at the feeder. They give me hope that spring will come … eventually. 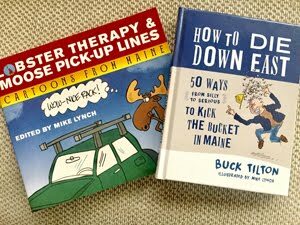 Blog cartoons by me, Mike Lynch, originally appeared in Prospect Magazine (top) and Harvard Business Review (down there). 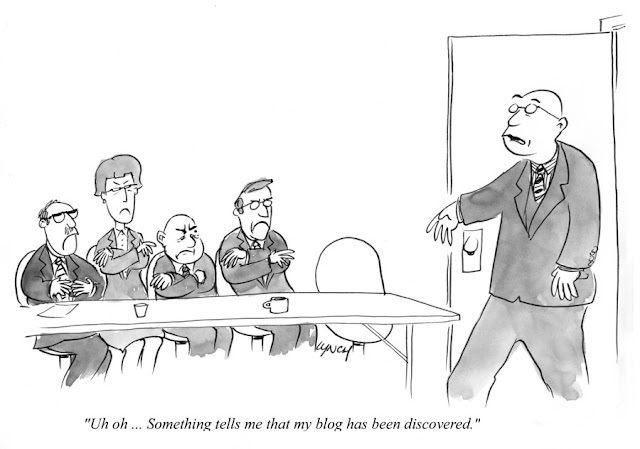 I was asked in an email "How does one start a blog?" I wrote a short note back, and thought I would share my response here. I use Blogger because Blogger is free and Blogger blogs appear on Google searches, which draw more people to your blog. 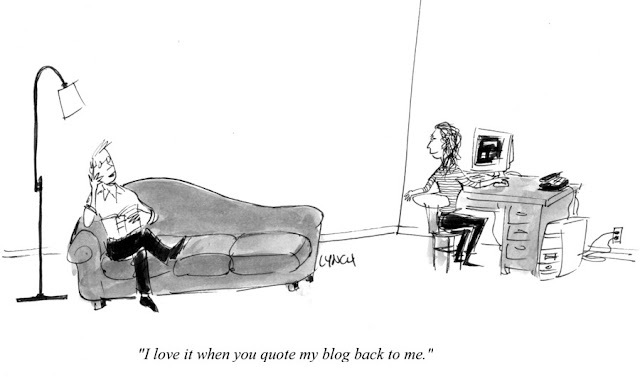 I began my blog in 2006. Within a few years, it had a reputation as a "go to" place for cartoonists. Lots of people liked it and its presence has helped awareness of who I am and what I do. But, look out: there is no equation like "the number of hours I spend doing my blog equals a specific dollar of income." Or, in fancy CPA-speak, there's no exact ROI formula. Anyway, I do it because I enjoy it and that's really the secret to maintaining a blog: that you are excited to share stuff. And by stuff I mean "content." You have to have new content, every day. 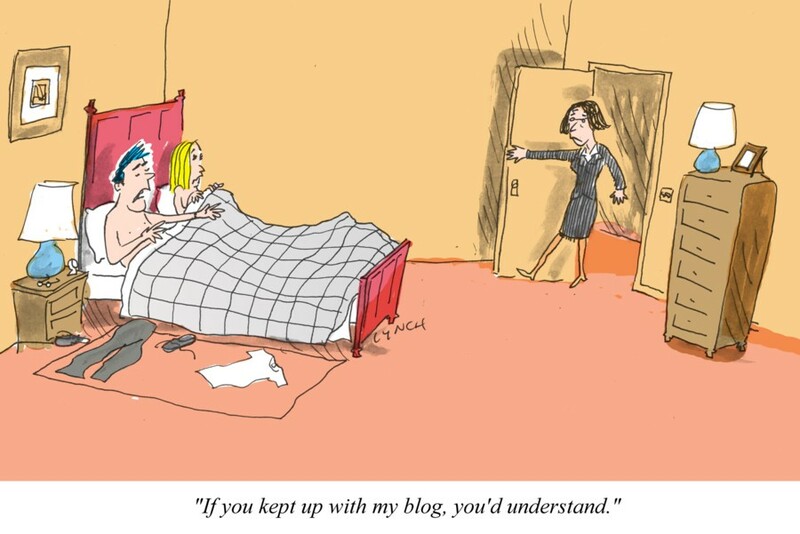 Content drives traffic to your blog. Blogging takes time and there are certainly days when it's particularly grinding to wake up and wonder, What will I put up on my blog today? Hope this helps. I get thousands of people to my blog every day -- and even the stuff on the blog that isn't about cartooning (like the posts about our garden) generate page views and comments. Related: Rob Kuhns' BIRTH OF THE LIVING DEAD documentary page at First Run Features. Here's the teaser trailer for the first documentary on James Thurber. The short trailer is produced by First Run Features. Looks like this documentary is so new, it's not on their site yet. Here's some hour-long audio from the Chicago Alternative Comics Expo (CAKE) convention in 2013: Kim Deitch interviewed by Caitlin McGurk. Kim Deitch is one of the founding fathers of Underground Comics, and appeared in the flash-point anthologies "Raw" and "Weirdo". Last year he released "The Adventures of Kathrine Whaley", published by Fantagraphics Books. Caitlin McGurk is a librarian and curator at the Billy Ireland Cartoon Library and Museum, and is a cartoonist and author. The discussion was recorded on June 17th, 2013, at The Center on Halsted as part of programming for the Chicago Alternative Comics Expo. These are available for you to look at and enjoy (that's free) and for presentations and newsletters (for a fee). 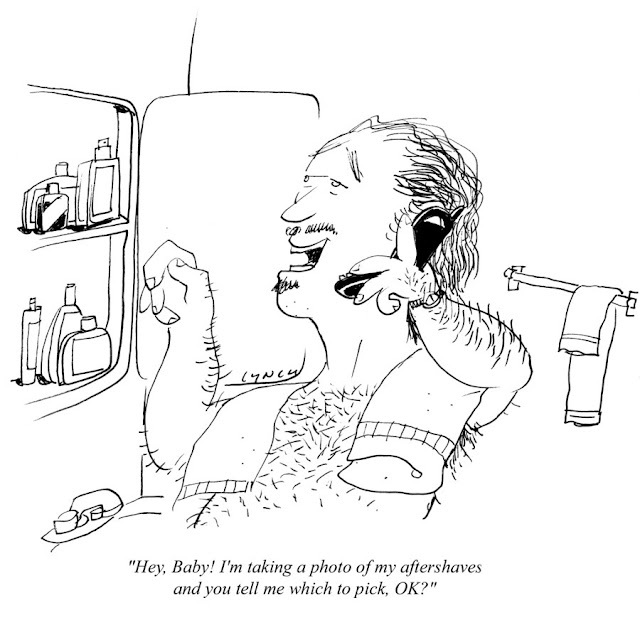 Above: a cartoon from Reader's Digest. 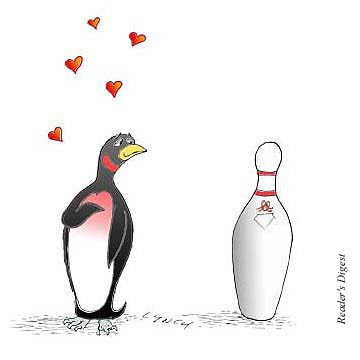 The penguin in love with a bowling pin cartoon is the one I use on my business card. "I look forward to growing old with you. 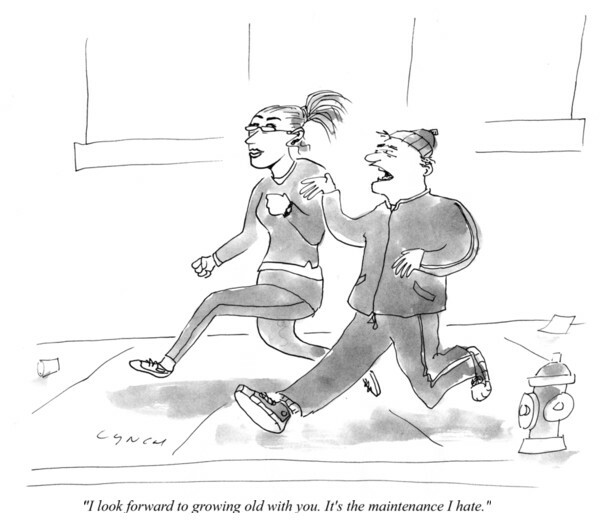 It's the maintenance I hate." I actually said this while jogging along Pacific Street in Brooklyn. Every once in a while I say something that becomes a cartoon. The fact I remembered it, drew it up and sent it out is a testament to my concentration. Usually when I say something funny, it disappears into the ether. I forget it. The cartoon was published in the Wall Street Journal. "Breaking up is hard to do. 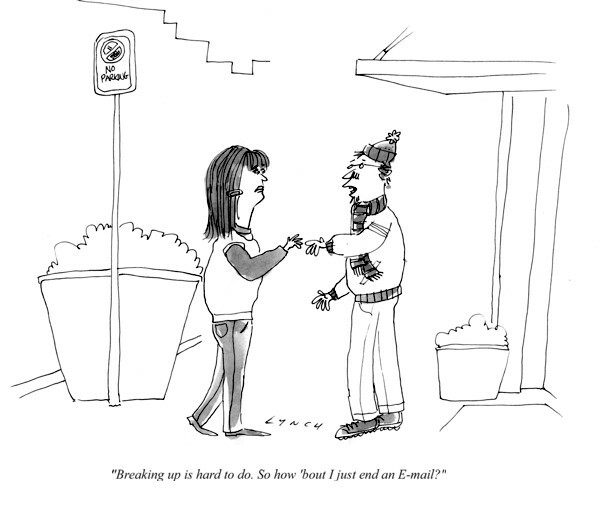 So how 'bout I just send an e-mail?" 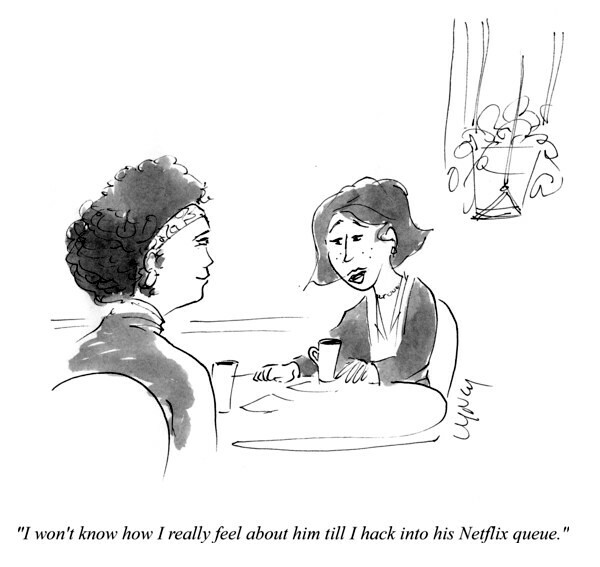 "I won't know how I really feel about him til I hack into his Netflix queue." 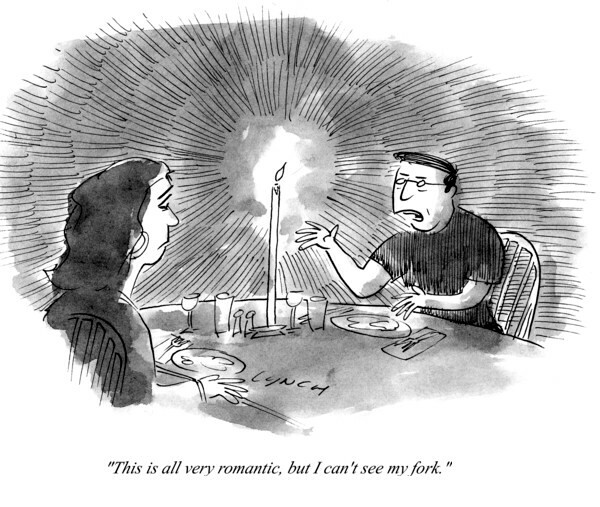 "This is all very romantic, but I can't see my fork." "I accept. 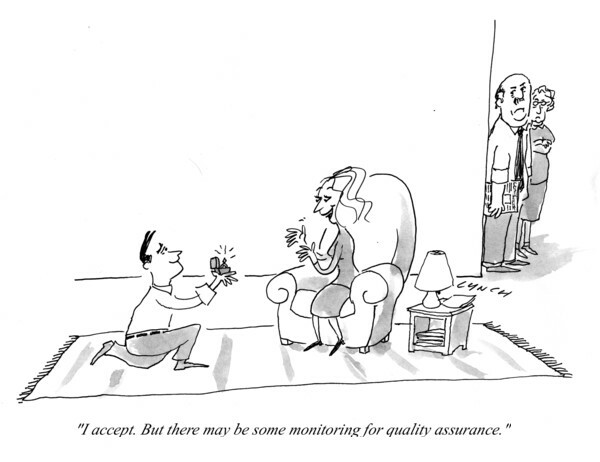 But there may be some monitoring for quality assurance." 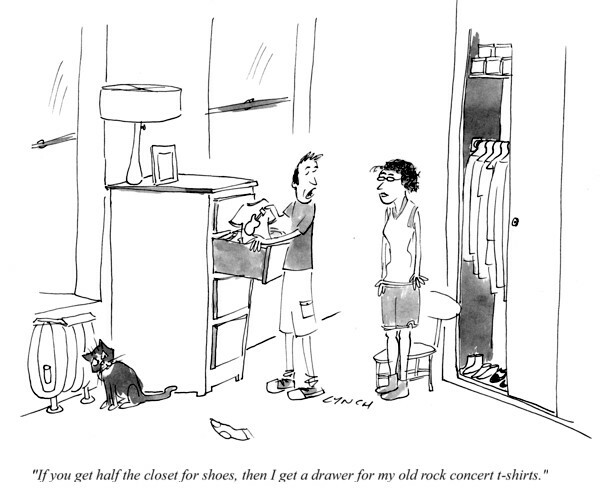 "If you get half the closet for shoes, then I get a drawer for my old rock concert t-shirts." 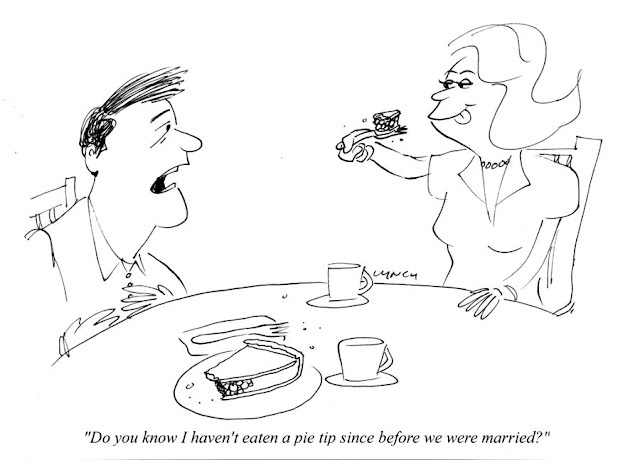 "Do you know I haven't eaten a pie tip since before we were married?" 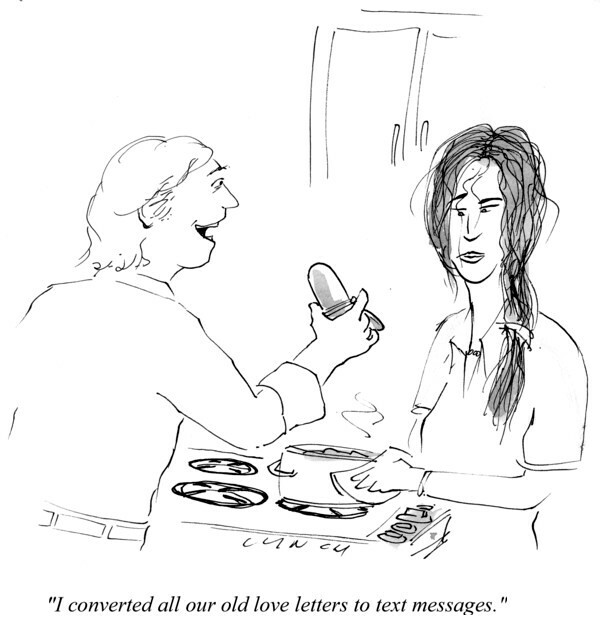 "I converted all our old love letters to text messages." 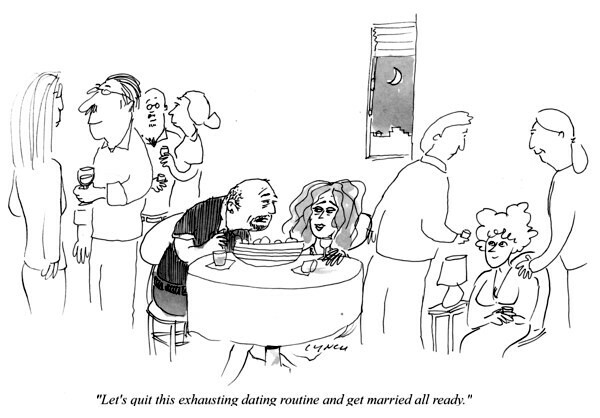 "Let's quit this exhausting dating routine and get married all ready." 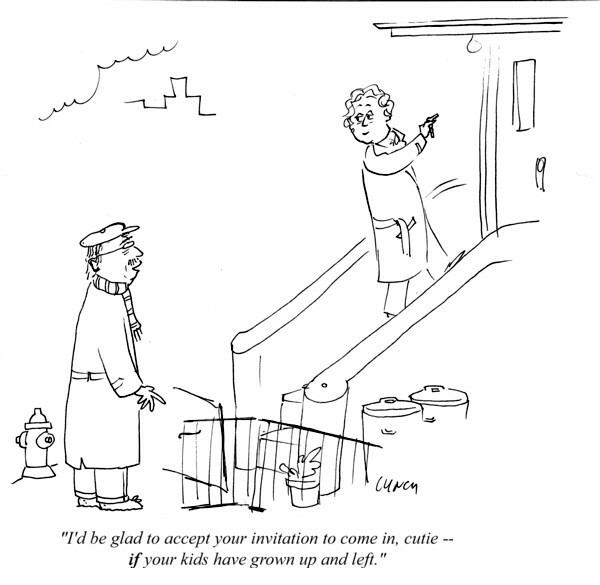 "I'd be glad to accept your invitation to come in cutie -- if your kids have grown up and left." 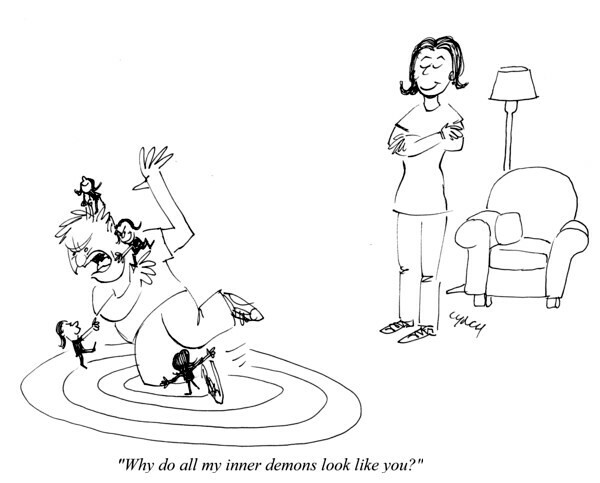 "Why do all my inner demons look like you?" "I'm emotional. 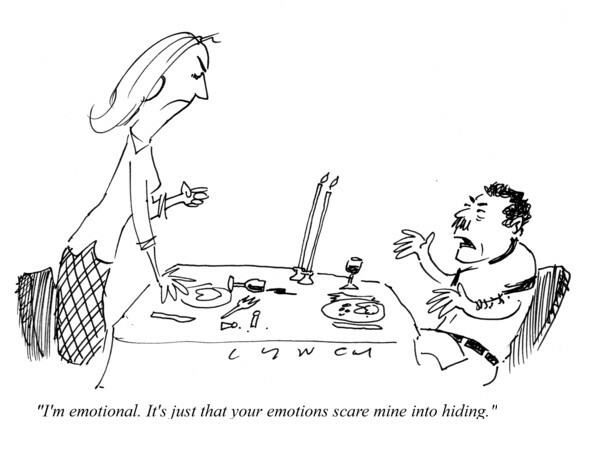 It's just that yours scare mine into hiding." 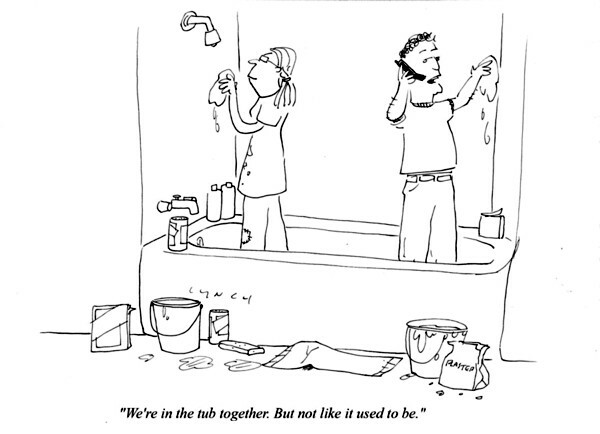 "We're in the tub together. But not like it used to be." "Remember when we were young and fancy free -- back before everything had to have coasters under it?" "No, you're not interrupting a damn thing. 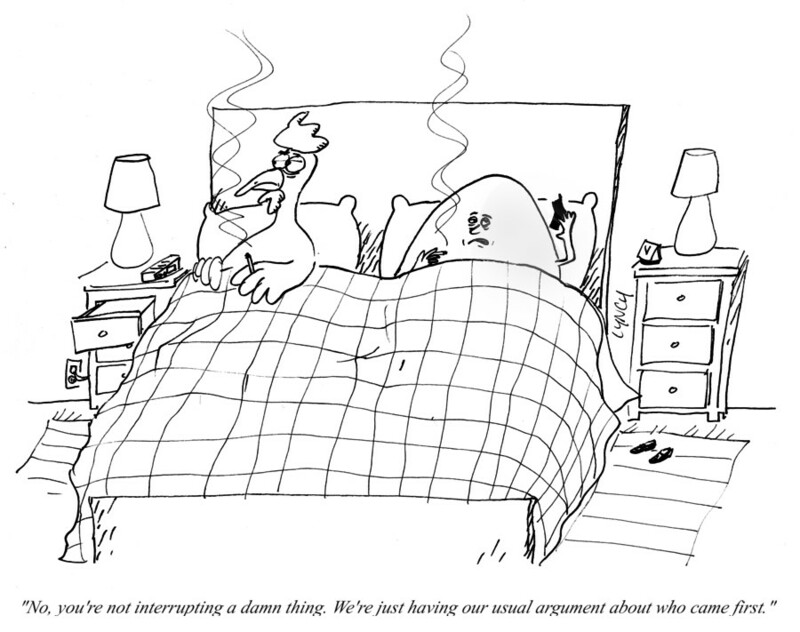 We're just having our usual argument about who came first." From an old greeting card from Joli Greeting Card Co. in Chicago, IL. "You may already know this but I thought I'd pass it on. 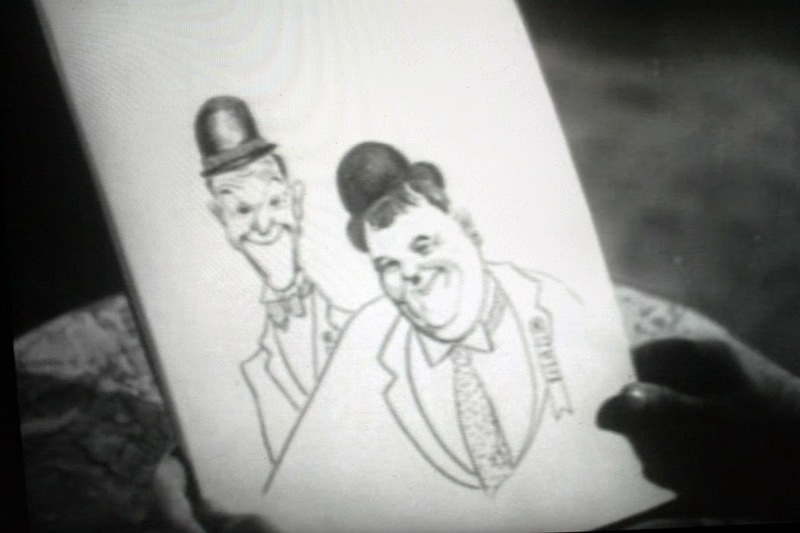 Watched 'Flying Deuces' with Laurel and Hardy. It opens with them in a Paris cafe having a 'photograph' taken. Turns out the sketch (according to IMDB) is by fellow comedian and writer on the movie, Harry Langdon." Ha ha! No, I did not know that! Harry Langdon, a major star in the silent era (making $7,500 a week at his peak in the 1920s), whose best features were directed by Arthur Ripley and Frank Capra. The story goes that he fired Capra, and directed himself in some movies. They all tanked. Capra would explain that Langdon did not understand the character he had created. But Langdon persevered, acting in the sound era, as well as writing. He was a writer on "Flying Deuces." But I do know know for sure if he was the fellow who actually drew this drawing. I tend to think that he may very well be for some reason. I don't know what they are calling this storm ("Stormageddon," "Stormpocolypse," "Shirley" -- I don't know), but it was a big one. High winds in this corner of New Hampshire, so snow was anywhere between 8 and 14 inches. And wet. It was a slog to clean up. Uo and down the driveway …. Video: What If the Olympics Were on the Hoth Ice Planet? Here's a …. well, just take a look. Big tip of the Imperial helmet to Brian Fies! Want to see comic book stories of Gerry Anderson's UFO TV series, Captain Scarlet, Joe 90 -- or Jon Pertwee's Doctor Who? 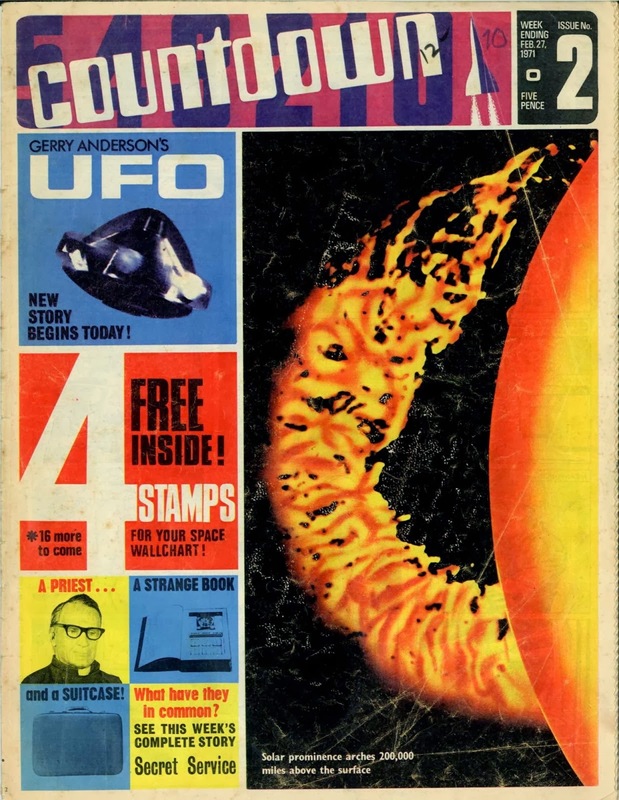 Saved From the Paper Drive has the British mag COUNTDOWN #2 from 1971, scanned in all its retro TV Sci Fi glory. Go gorge! Some nicely designed retro record covers seen in thrift store. One thing you can't tell: except for the first two, these are all 45RPM 7 inch records! They are not regular size LPs. Some inspirational design here -- at least so far as I'm concerned. And, no, I did not buy these. I just took the photos and put them back. Is that bad? Such a nice looking group, this Lynchburg (no relation) Baptist College Chorale. Where are they now? The provocatively steamy cover of Tabu. Love the juxtaposition of illustration and graphic design and photo. Oh to be the tiny couple dancing/drowning in the pink champagne glass! Morton Downey Sings! Not the guy with the 80s TV show, but his dad. Love the cartoon dudes with the pilgrim hats! A big pink John Philip Sousa head will make these singles fly off the shelf! Shep Fields looks more like an account than a guy that can ripple anyone's rhythm. But, mama always said not to judge a person by their looks. The floating red, white and blue masks of Freddy Martin and His Orchestra. What they all got to do with Marie Antoinette here in anyone's guess. The Capitol REcords' Ray Anthony "Daddy Long Legs" cover is simple and evocative of its time. Love the colors on this Guy Lombardo one. Should Gag Cartoonists Use Writers?